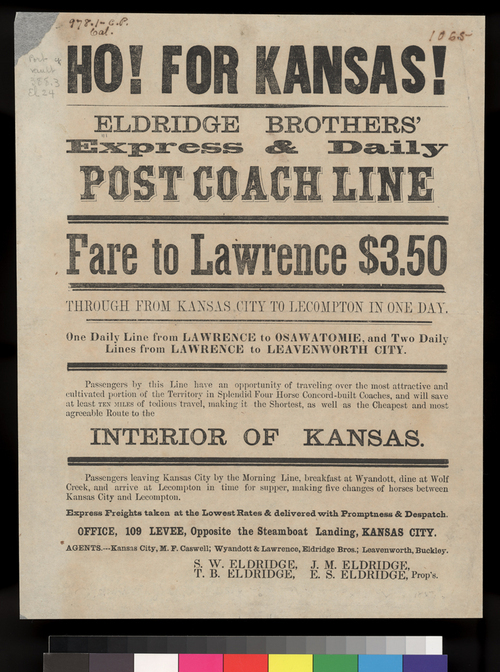 This printed notice for the Eldridge Brothers' coach line advertised the fare to Lawrence as $3.50. The coach line had routes from Kansas City to Lecompton, Lawrence to Osawatomie, and Lawrence to Leavenworth City. The notice includes information about the coaches, food, and changes of horses. People - Notable Kansans - Eldridge, Shalor W.